Shipping @ speed of light! Price is per blank. Multiple blanks shown to illustrate the possible variety. The blanks measure 7/8" square by 5" long. The RhinoPlastic blanks are tougher to work with than the usual Acrylic Acetate blanks that are sold in the other categories (see Bear Tooth Woods Acrylics, Berea Acrylics, and More Acrylics categories for the easy to turn Acrylic Acetate), but they are spectacular when finished. The sparkle and depth of these blanks is outstanding. They are well worth the effort for the more experienced turners. Go slow. Use sharp tools and keep your sharpener handy. They actually finish easier than the acrylic acetate blanks. 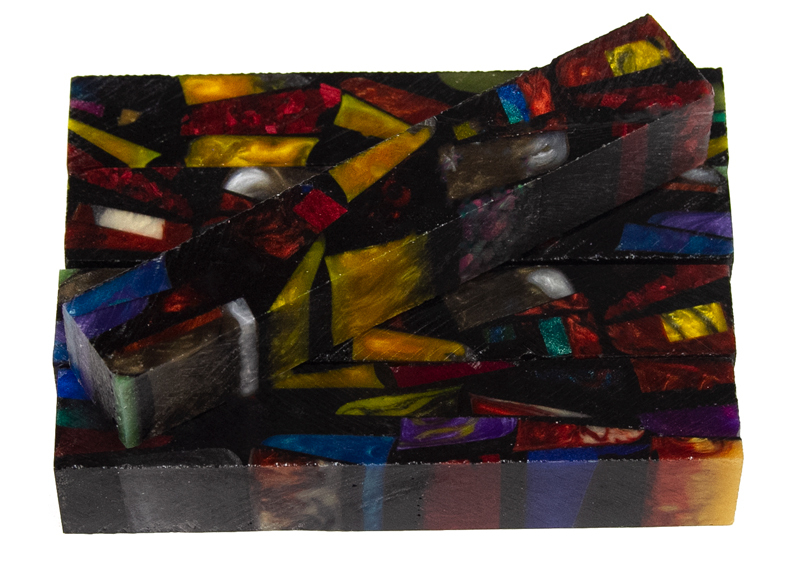 Notify me when Black Stained Glass RhinoPlastic Resin Pen Blank is restocked.